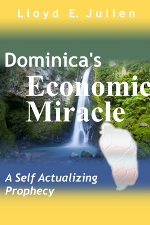 Description...A simple, common sense perspective on the issues facing Dominica with regard to economic development. The author, Lloyd Julien presents his views on his prescriptions for the economic growth that he seeks in his country. The sale of this ebook is in itself a part of that prescription and the success of this ebook is the beginning of that process. This also serves as a prescription for any country struggling with the issues of economic development - for those who have the courage.